As was the case in Egypt this summer, the large-scale protests hoping to throw out Thai Prime Minister Yingluck Shinawatra turned violent only days after Shutdown Bangkok kicked off, and now Thai authorities are "very seriously" thinking of declaring a state of emergency. The move wouldn't be coming out of left field — two explosions went off in the country's capital only yesterday, leaving 28 people wounded, and one person was killed after bomb went off Friday. "We're prepared to use the emergency decree ... Everyone involved including the police, the military and the government is considering this option very seriously, but has not yet come to an agreement," the National Security Council chief told Reuters Monday. "The protesters have said they will close various government offices. So far, their closures have been symbolic, they go to government offices and then they leave. But if their tactics change and they close banks or government offices permanently, then the chance for unrest increases and we will have to invoke this law." The demonstrations, organized by the People’s Democratic Reform Committee, are hoping to occupy twenty key areas of the capital and shut down all the major government institutions in order to throw out Yingluck’s elected government and replace it with a hand-picked ‘people’s council.’ Why? Well, the whole thing started when a controversial amnesty blanket bill pushed through the lower house of Parliament a couple of months back, sparking fears that Yingluck's brother — the former Thai Prime Minister Thaksin, who was convicted of criminal corruption in 2008 and has since been in self-imposed exile — would return. The situation snowballed quickly into a general anti-government movement, with protesters accusing Yingluck of having her puppet-strings pulled by Thaksin, and her whole administration of vote-buying and corruption. Just over a month ago, Yingluck called for a snap elections to be held on February 2, hoping to appease the rapidly escalating demonstrations. But demonstrators immediately rejected the election, scared that Yingluck’s party — which is widely supported by the poorer, rural areas of Thailand, and has been associated with electoral fraud — would just win again. 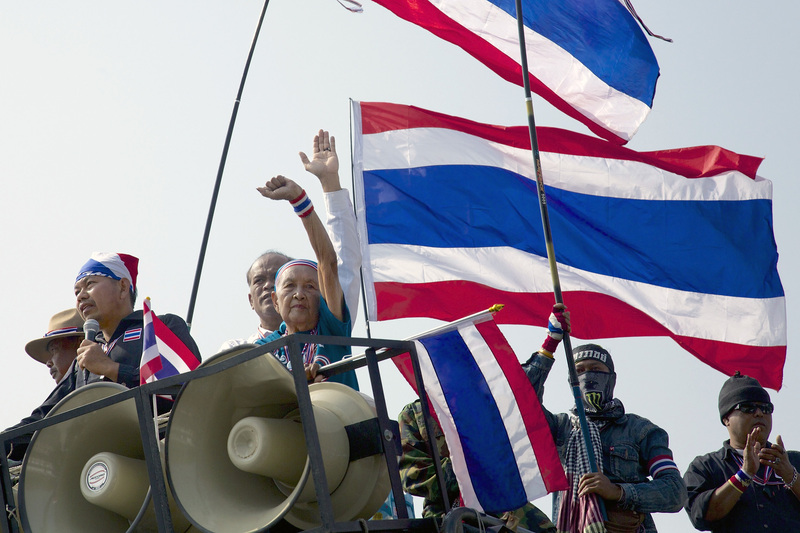 “The goal is to get rid of the Thaksin regime,” protest leader Suthep Thaugsuba said last week. “Yingluck’s government is Thaksin’s tool, that’s why we have to force out her government." The emergency decree would mean a dramatic shift in the already unstable situation: it gives security forces wide-ranging powers to detain suspects without charge, censor the media, cut off access to parts of the country, and impose curfews. Crucially, it would also raise the ghost of the 2010 military crackdown on protestors — led by the “Red Shirts” against then- Prime Minister Abhisit Vejjajiva and his Democrat Party government — that left over 90 people dead. So far, Yingluck has been careful to avoid the possibility of military intervention, ordering police forces to avoid confrontations with protesters — but that could all change if a state of emergency is declared.